The United States declared war on Germany on April 6, 1917, more than two and a half years after World War I started. A ceasefire and Armistice was declared on November 11, 1918. Before entering the war, the U.S. had remained neutral, though it had been an important supplier to Great Britain and the other Allied powers. The U.S. made its major contributions in terms of supplies, raw material and money, starting in 1917. American soldiers under General of the Armies John Pershing, Commander-in-Chief of the American Expeditionary Force (AEF), arrived at the rate of 10,000 men a day on the Western Front in the summer of 1918. During the war the U.S. mobilized over 4 million military personnel and suffered 110,000 deaths, including around 45,000 who died due to the 1918 Spanish influenza outbreak (30,000 before they even reached France). The war saw a dramatic expansion of the United States government in an effort to harness the war effort and a significant increase in the size of the U.S. Armed Forces. The American entry into World War I came on April 6, 1917, after more than two and a half years of efforts by President Woodrow Wilson to keep the United States out of the war. Apart from an Anglophile element urging early support for the British, American public opinion reflected that of the president: the sentiment for neutrality was particularly strong among Irish Americans, German Americans and Scandinavian Americans, as well as among church leaders and among women in general. On the other hand, even before World War I had broken out, American opinion had been more negative toward Germany than towards any other country in Europe. Over time, especially after reports of atrocities in Belgium in 1914 and following the sinking of the passenger liner RMS Lusitania in 1915, the American people increasingly came to see Germany as the aggressor in Europe. As U.S. President, it was Wilson who made the key policy decisions over foreign affairs: while the country was at peace, the domestic economy ran on a laissez-faire basis, with American banks making huge loans to Britain and France — funds that were in large part used to buy munitions, raw materials and food from across the Atlantic. Until 1917, Wilson made minimal preparations for a land war and kept the United States Army on a small peacetime footing, despite increasing demands for enhanced preparedness. He did however expand the United States Navy. In 1917, with Russia experiencing political upheaval following widespread disillusionment there over the war, and with Britain and France low on credit, Germany appeared to have the upper hand in Europe, while the Ottoman Empire clung to its possessions in the Middle East. In the same year, Germany decided to resume unrestricted submarine warfare against any vessel approaching British waters; this attempt to starve Britain into surrender was balanced against the knowledge that it would almost certainly bring the United States into the war. Germany also made a secret offer to help Mexico regain territories lost in the Mexican–American War in an encoded telegram known as the Zimmermann Telegram, which was intercepted by British Intelligence. Publication of that communique outraged Americans just as German U-boats started sinking American merchant ships in the North Atlantic. 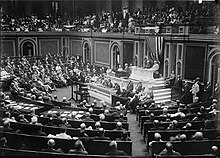 Wilson then asked Congress for "a war to end all wars" that would "make the world safe for democracy", and Congress voted to declare war on Germany on April 6, 1917. On December 7, 1917, the U.S. declared war on Austria-Hungary. U.S. troops began arriving on the Western Front in large numbers in 1918. After the war began in 1914, the United States proclaimed a policy of neutrality despite president Woodrow Wilson's antipathies against Germany. Early in the war, the United States started to favor the British and their allies. President Wilson aimed to broker a peace and sent his top aide, Colonel House, on repeated missions to the two sides, but each remained so confident of victory that they ignored peace proposals. When the German U-boat U-20 sank the British liner Lusitania on 7 May 1915 with 128 US citizens aboard, Wilson demanded an end to German attacks on passenger ships, and warned that the US would not tolerate unrestricted submarine warfare in violation of international law and of human rights. Wilson's Secretary of State, William Jennings Bryan, resigned, believing that the President's protests against the German use of U-boat attacks conflicted with America's official commitment to neutrality. On the other hand, Wilson came under pressure from war hawks led by former president Theodore Roosevelt, who denounced German acts as "piracy", and from British delegations under Cecil Spring Rice and Sir Edward Grey. U.S. Public opinion reacted with outrage to the suspected German sabotage of Black Tom in Jersey City, New Jersey on 30 July 1916, and to the Kingsland explosion on 11 January 1917 in present-day Lyndhurst, New Jersey. Crucially, by the spring of 1917 President Wilson's official commitment to neutrality had finally unraveled. Wilson realized he needed to enter the war in order to shape the peace and implement his vision for a League of Nations at the Paris Peace Conference. American public opinion was divided, with most Americans until early 1917 largely of the opinion that the United States should stay out of the war. Opinion changed gradually, partly in response to German actions in Belgium and the Lusitania, partly as German Americans lost influence, and partly in response to Wilson's position that America had to play a role to make the world safe for democracy. In the general public, there was little if any support for entering the war on the side of Germany. The great majority of German Americans, as well as Scandinavian Americans, wanted the United States to remain neutral; however, at the outbreak of war, thousands of US citizens had tried to enlist in the German army. The Irish Catholic community, based in the large cities and often in control of the Democratic Party apparatus, was strongly hostile to helping Britain in any way, especially after the Easter uprising of 1916 in Ireland. Most of the Protestant church leaders in the United States, regardless of their theology, favoured pacifistic solutions whereby the United States would broker a peace. Most of the leaders of the women's movement, typified by Jane Addams, likewise sought pacifistic solutions. The most prominent opponent of war was industrialist Henry Ford, who personally financed and led a peace ship to Europe to try to negotiate among the belligerents; no negotiations resulted. Britain had significant support among intellectuals, Yankees, and families with close ties to Britain. The most prominent leader was Samuel Insull of Chicago, a leading industrialist who had emigrated from England. Insull funded many propaganda efforts, and financed young Americans who wished to fight by joining the Canadian military, Canada at that time being a Dominion of the British Empire. By 1915, Americans were paying much more attention to the war. The sinking of the Lusitania aroused furious denunciations of German brutality. By 1915, in Eastern cities a new "Preparedness" movement emerged. It argued that the United States needed to build up immediately strong naval and land forces for defensive purposes; an unspoken assumption was that America would fight sooner or later. The driving forces behind Preparedness were all Republicans, notably General Leonard Wood, ex-president Theodore Roosevelt, and former secretaries of war Elihu Root and Henry Stimson; they enlisted many of the nation's most prominent bankers, industrialists, lawyers and scions of prominent families. Indeed, there emerged an "Atlanticist" foreign policy establishment, a group of influential Americans drawn primarily from upper-class lawyers, bankers, academics, and politicians of the Northeast, committed to a strand of Anglophile internationalism. The Preparedness movement had what political scientists call a "realism" philosophy of world affairs—they believed that economic strength and military muscle were more decisive than idealistic crusades focused on causes like democracy and national self-determination. Emphasizing over and over the weak state of national defences, they showed that the United States' 100,000-man Army, even augmented by the 112,000-strong National Guard, was outnumbered 20 to one by the German army; similarly in 1915, the armed forces of Great Britain and the British Empire, France, Russia, the Austro-Hungarian Empire, Ottoman Empire, Italy, Bulgaria, Romania, Serbia, Belgium, Japan and Greece were all larger and more experienced than the United States military. They called for UMT or "universal military service" under which the 600,000 men who turned 18 every year would be required to spend six months in military training, and then be assigned to reserve units. The small regular army would primarily be a training agency. Public opinion, however, was not willing to go that far. Both the regular army and the Preparedness leaders had a low opinion of the National Guard, which it saw as politicized, provincial, poorly armed, ill trained, too inclined to idealistic crusading (as against Spain in 1898), and too lacking in understanding of world affairs. The National Guard on the other hand was securely rooted in state and local politics, with representation from a very broad cross section of the US political economy. The Guard was one of the nation's few institutions that (in some northern states) accepted black men on an equal footing with white men. In reality, neither the US Army nor US Navy was in shape for war in terms of manpower, size, military hardware or experience. The Navy had fine ships but Wilson had been using them to threaten Mexico, and the fleet's readiness had suffered. The crews of the Texas and the New York, the two newest and largest battleships, had never fired a gun, and the morale of the sailors was low. The Army and Navy air forces were tiny in size. Despite the flood of new weapons systems unveiled in the war in Europe, the Army was paying scant attention. For example, it was making no studies of trench warfare, poison gas or tanks, and was unfamiliar with the rapid evolution of aerial warfare. The Democrats in Congress tried to cut the military budget in 1915. The Preparedness movement effectively exploited the surge of outrage over the "Lusitania" in May 1915, forcing the Democrats to promise some improvements to the military and naval forces. Wilson, less fearful of the Navy, embraced a long-term building program designed to make the fleet the equal of the British Royal Navy by the mid-1920s, although this would not come to pass until after World War II. "Realism" was at work here; the admirals were Mahanians and they therefore wanted a surface fleet of heavy battleships second to none—that is, equal to Great Britain. The facts of submarine warfare (which necessitated destroyers, not battleships) and the possibilities of imminent war with Germany (or with Britain, for that matter), were simply ignored. Wilson's decision touched off a firestorm. Secretary of War Lindley Garrison adopted many of the proposals of the Preparedness leaders, especially their emphasis on a large federal reserves and abandonment of the National Guard. Garrison's proposals not only outraged the provincial politicians of both parties, they also offended a strongly held belief shared by the liberal wing of the Progressive movement, that was, that warfare always had a hidden economic motivation. Specifically, they warned the chief warmongers were New York bankers (such as J. P. Morgan) with millions at risk, profiteering munition makers (such as Bethlehem Steel, which made armor, and DuPont, which made powder) and unspecified industrialists searching for global markets to control. Antiwar critics blasted them. These selfish special interests were too powerful, especially, Senator La Follette noted, in the conservative wing of the Republican Party. The only road to peace was disarmament in the eyes of many. Wilson seemed to have won over the middle classes, but had little impact on the largely ethnic working classes and the deeply isolationist farmers. Congress still refused to budge, so Wilson replaced Garrison as Secretary of War with Newton Baker, the Democratic mayor of Cleveland and an outspoken opponent of preparedness. The upshot was a compromise passed in May 1916, as the war raged on and Berlin was debating whether America was so weak it could be ignored. The Army was to double in size to 11,300 officers and 208,000 men, with no reserves, and a National Guard that would be enlarged in five years to 440,000 men. Summer camps on the Plattsburg model were authorized for new officers, and the government was given $20 million to build a nitrate plant of its own. Preparedness supporters were downcast, the antiwar people were jubilant. The United States would now be too weak to go to war. Colonel Robert L. Bullard privately complained that "Both sides [Britain and Germany] treat us with scorn and contempt; our fool, smug conceit of superiority has been exploded in our faces and deservedly.". The House gutted the naval plans as well, defeating a "big navy" plan by 189 to 183, and cancelling the battleships. The battle of Jutland (May 31/June 1, 1916) saw the main German High Seas Fleet engage in a monumental yet inconclusive clash with the far stronger Grand Fleet of the Royal Navy. Arguing this battle proved the validity of Mahanian doctrine, the navalists took control in the Senate, broke the House coalition, and authorized a rapid three-year buildup of all classes of warships. A new weapons system, naval aviation, received $3.5 million, and the government was authorized to build its own armour-plate factory. The very weakness of American military power encouraged Berlin to start its unrestricted submarine attacks in 1917. It knew this meant war with America, but it could discount the immediate risk because the US Army was negligible and the new warships would not be at sea until 1919 by which time the war would be over, Germany thought, with Germany victorious. The notion that armaments led to war was turned on its head: refusal to arm in 1916 led to war in 1917. In January 1917, Germany resumed unrestricted submarine warfare. The German Foreign minister, Arthur Zimmermann invited revolution-torn Mexico to join the war as Germany's ally against the United States in the Zimmermann Telegram. In return, the Germans would send Mexico money and help it recover the territories of Texas, New Mexico and Arizona that Mexico lost during the Mexican–American War 70 years earlier. British intelligence intercepted the telegram and passed the information on to Washington. Wilson released the Zimmerman note to the public and Americans saw it as a casus belli—a cause for war. At first, Wilson tried to maintain neutrality while fighting off the submarines by arming American merchant ships with guns powerful enough to sink German submarines on the surface (but useless when the U-boats were under water). After submarines sank seven US merchant ships, Wilson finally went to Congress calling for a declaration of war on Germany, which Congress voted on April 6, 1917. As a result of the Russian February Revolution in 1917, the Tsar abdicated and was replaced by a Russian Provisional Government. This helped overcome Wilson's reluctance to having the US fight alongside a country ruled by an absolutist monarch. Pleased by the Provisional Government's pro-war stance, the US accorded the new government diplomatic recognition on March 9, 1917. Although the United States declared war on Germany on April 6, 1917, it did not initially declare war on the other Central Powers, a state of affairs that Woodrow Wilson described as an "embarrassing obstacle" in his State of the Union speech. Congress declared war on the Austro-Hungarian Empire on December 7, 1917, but never made declarations of war against the other Central Powers, Bulgaria, the Ottoman Empire or the various co-belligerents allied with the Central Powers. Thus, the United States remained uninvolved in the military campaigns in central and eastern Europe, the Middle East, the Caucasus, North Africa, Sub-Saharan Africa, Asia and the Pacific. 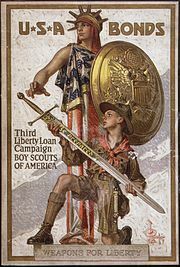 World War I propaganda poster for enlistment in the US Army. The United States Food Administration under Herbert Hoover launched a massive campaign to teach Americans to economize on their food budgets and grow victory gardens in their backyards, where crops were produced for US soldiers. It managed the nation's food distribution and prices. 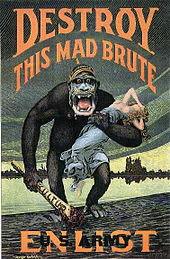 Crucial to US participation was the sweeping domestic propaganda campaign.In order to achieve this, President Wilson created the Committee on Public Information through Executive Order 2594 on April 13, 1917, which was the first state bureau in the United States that's main focus was on propaganda. The man charged by President Wilson with organizing and leading the CPI was George Creel, A once relentless journalist and political campaign organizer who would search without mercy for any bit of information that would paint a bad picture on his opponents.Creel went about his task with boundless energy. He was able to create an intricate, unprecedented propaganda system that plucked and instilled an influence on almost all phases of normal American life. In the press—as well as through photographs, movies, public meetings, and rallies—the CPI was able to dowse the public with Propaganda that brought on American patriotism whilst creating an Anti-German image into the young populous, further quieting the voice of the pro-neutrality supporters. It also took control of market regarding the dissemination of war-related information on the American home front, which in turn promoted a system of voluntary censorship in the country's newspapers and magazines while simultaneously policing these same media outlets for seditious content or Anti-American support. The campaign consisted of tens of thousands of government-selected community leaders giving brief carefully scripted pro-war speeches at thousands of public gatherings. Along with other branches of government and private vigilante groups like the American Protective League, it also included the general repression and harassment of people either opposed to American entry into the war or of German heritage. Rumors about a German-induced attempt to start uprising among Black Americans caused a wave of lynchings to occur in the Southern United States. Other forms of propaganda included newsreels, photos, large-print posters (designed by several well-known illustrators of the day, including Louis D. Fancher and Henry Reuterdahl), magazine and newspaper articles, and billboards. At the end of the war in 1918, after the Armistice was signed, the CPI was disbanded, yet many of the tactics used by the CPI are still practice and used by governments today. As late as 1917, the United States maintained only a small army, one which was in fact smaller than thirteen of the nations and empires already active in the war. After the passage of the Selective Service Act in 1917, it drafted 4 million men into military service. By the summer of 1918, about 2 million US soldiers had arrived in France, about half of whom eventually saw front-line service; by the Armistice of November 11 approximately 10,000 fresh soldiers were arriving in France daily. In 1917, Congress gave US citizenship to Puerto Ricans when they were drafted to participate in World War I, as part of the Jones Act. In the end, Germany miscalculated the United States' influence on the outcome of the conflict, believing it would be many more months before US troops would arrive and overestimating the effectiveness of U-boats in slowing the American buildup. The United States Navy sent a battleship group to Scapa Flow to join with the British Grand Fleet, destroyers to Queenstown, Ireland and submarines to help guard convoys. Several regiments of Marines were also dispatched to France. The British and French wanted US units used to reinforce their troops already on the battle lines and not to waste scarce shipping on bringing over supplies. The US rejected the first proposition and accepted the second. General John J. Pershing, American Expeditionary Forces (AEF) commander, refused to break up US units to serve as mere reinforcements for British Empire and French units. As an exception, he did allow African-American combat regiments to fight in French divisions. The Harlem Hellfighters fought as part of the French 16th Division, earning a unit Croix de Guerre for their actions at Château-Thierry, Belleau Wood, and Séchault. On the battlefields of France in spring 1918, the war-weary Allied armies enthusiastically greeted the fresh American troops. They arrived at the rate of 10,000 a day, at a time when the Germans were unable to replace their losses. The Americans won a victory at Cantigny, then again in defensive stands at Chateau-Thierry and Belleau Wood. 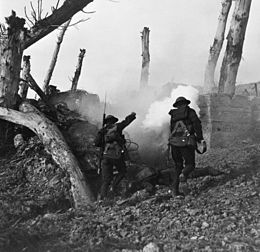 The Americans helped the British Empire, French and Portuguese forces defeat and turn back the powerful final German offensive (Spring Offensive of March to July, 1918), and most importantly, the Americans played a role in the Allied final offensive (Hundred Days Offensive of August to November). However, many American commanders used the same flawed tactics which the British, French, Germans and others had abandoned early in the war, and so many American offensives were not particularly effective. Pershing continued to commit troops to these full- frontal attacks, resulting in high casualties without noticeable military success against experienced veteran German and Austrian-Hungarian units. Nevertheless, the infusion of new and fresh US troops greatly strengthened the Allies' strategic position and boosted morale. The Allies achieved victory over Germany on November 11, 1918 after German morale had collapsed both at home and on the battlefield. The government promptly cancelled wartime contracts, ended the draft, and started to bring home its troops from Europe as fast as transport became available. However, there was no GI Bill or financial or educational benefits for veterans, and the lack became a major political issue, especially for the large veterans' groups such as the Veterans of Foreign Wars and the new American Legion. The readjustment period was marked by soaring unemployment, massive strikes, and race riots in 1919. The public demanded a return to "normalcy", and repudiated Wilson with the election of conservative Republican Warren G. Harding. ^ Jeanette Keith (2004). Rich Man's War, Poor Man's Fight: Race, Class, and Power in the Rural South during the First World War. U. of North Carolina Press. pp. 1–5. ISBN 978-0-8078-7589-6. ^ "World War One". BBC History. ^ Link, Arthur S. (1972). Woodrow Wilson and the Progressive Era, 1910–1917. New York: Harper & Row. pp. 252–282. ^ Jennifer K. Elsea; Matthew C. Weed (April 18, 2014). "Declarations of War and Authorizations for the Use of Military Force: Historical Background and Legal Implications" (PDF). p. 9. Retrieved July 21, 2014. ^ Kero, Reino; Kostiainen, Auvo; Virtanen, Keijo (1991). Uuden Maailman Jättiläinen: Yhdysvaltain historia (in Finnish). Keuruu: Otava. p. 332. ISBN 951-1-11435-2. ^ Jules Witcover, Black Tom: Imperial Germany's Secret War in America (1989). Also in January 1917, the Zimmerman Telegram, through which the German government sought to enlist Mexico as an ally and instigate a Mexican invasion of the U.S., was leaked, further inflaming anti-German sentiment. ^ "Constitution Act, 1867". Her Majesty the Queen in Right of Canada. March 29, 1867. p. s.9. Retrieved September 3, 2012. ^ Scott Manning (2007-01-04). "World War I: Troop Statistics". Scottmanning.com. Retrieved 2016-11-06. ^ "The Royal Navy". Britannica Online. Encyclopædia Britannica. Retrieved 3 June 2009. ^ see: Woodrow Wilson declares war on Germany. ^ "US declaration of war against Austria-Hungary | The Gilder Lehrman Institute of American History". Gilderlehrman.org. 1917-12-07. Retrieved 2016-11-06. ^ "Over Here: WWI and the Fight for the American Mind". The New York Public Library. Retrieved 2019-02-25. ^ Kero, Reino; Kostiainen, Auvo; Virtanen, Keijo (1991). Uuden Maailman Jättiläinen: Yhdysvaltain historia (in Finnish). Keuruu: Otava. p. 334. ISBN 951-1-11435-2. ^ Kero, Reino; Kostiainen, Auvo; Virtanen, Keijo (1991). Uuden Maailman Jättiläinen: Yhdysvaltain historia (in Finnish). Keuruu: Otava. p. 335. ISBN 951-1-11435-2. ^ "Selective Service System: History and Records". Sss.gov. Archived from the original on May 7, 2009. Retrieved July 27, 2010. ^ a b "World War I Timeline - 1918 - A Fateful Ending". The History Place. Retrieved 2016-11-06. ^ Ferguson, Niall (1998). The Pity of War. Penguin. ^ Dixon Wecter, When Johnny Comes Marching Home (1970). ^ Burl Noggle, Into the Twenties – The United States From Armistice to Normalcy (1974). Byerly, Carol R. (2010). "The U.S. Military and the Influenza Pandemic of 1918–1919". Public Health Reports. United States National Library of Medicine. 125 (Suppl 3): 82–91. ISSN 1468-2877. PMC 2862337. PMID 20568570. Wevera, Peter C Wevera; van Bergenc, Leo (June 27, 2014). "Death from 1918 pandemic influenza during the First World War: a perspective from personal and anecdotal evidence". Influenza Other Respir Viruses. 8: 538–46. doi:10.1111/irv.12267. PMC 4181817. PMID 24975798. Snow, William J. Signposts of Experience: World War Memoits of Major General William J. Snow, USA-Retired, Chief of Field Artillery 1918-1927. CreateSpace Independent Publishing Platform, May 15, 2014. ISBN 978-1499673777. Keene, Jennifer D. "Remembering the “Forgotten War”: American Historiography on World War I." Historian 78#3 (2016): 439-468. First-hand accounts of World War I veterans, The Library of Congress Veterans History Project. This page was last edited on 10 April 2019, at 19:48 (UTC).